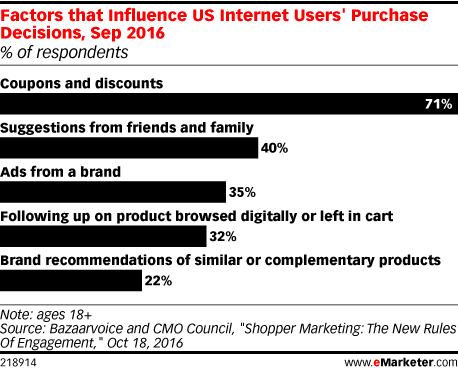 Among American shoppers, coupons have the biggest influence on purchase decisions, way ahead of suggestions from friends and ads from brands. With 71% citing coupons as an influence, it’s a no-brainer to add one to your site so you can get more sales. Adding popup coupons just makes sense. More than half of your customers won’t even shop unless you offer a coupon. 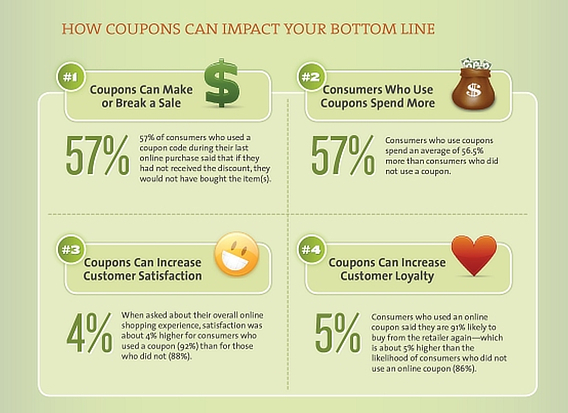 According to Kissmetrics, 86% of consumers say coupons influence their choice of brand. The same research shows that people who use coupons spend 57% more, and coupons also improve customer satisfaction and loyalty. 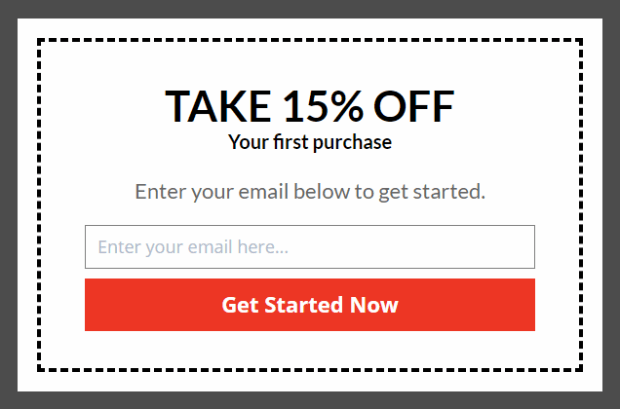 In this guide, we’ll show you step by step how to add a popup coupon to your site to boost sales. Which Popup Coupon App Should You Use? There are a lot of tools out there for creating generic coupon popups, but not all of them will get you the results you’re looking for. Some of your website visitors will find intrusive popups annoying. If you don’t want to annoy potential customers, it’s important to offer discounts in the right way. 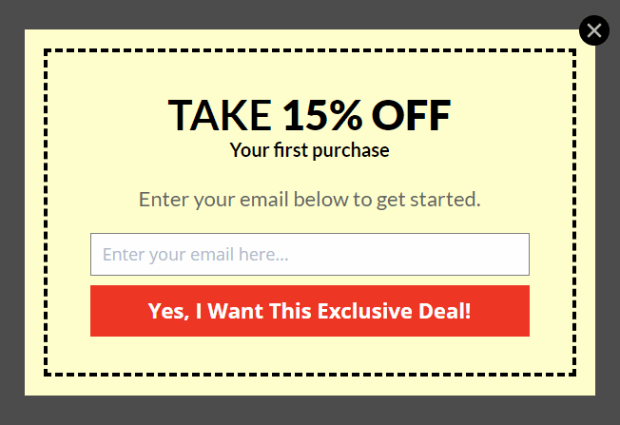 A popup coupon at the right time can make those who get the coupon feel like insiders while ensuring they still think your product is valuable. With OptinMonster, you can offer coupons in the right way, at the right time, to the right people, such as people who are actually likely to buy something. That’s because OptinMonster has advanced targeting features, allowing you to show coupons on specific pages, to specific visitors, at specific times, and specific locations. You can target coupons by device and can show certain popups based on visitors’ activity, or inactivity. Your popup coupons can also be used as powerful tools to reduce shopping cart abandonment when used with exit intent technology. 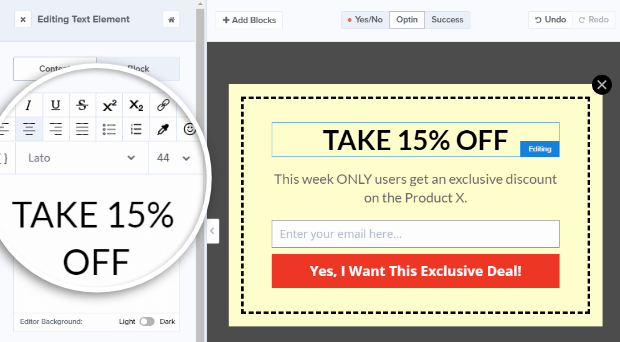 And you can combine our advanced targeting rules to be ultra-precise about who sees your popup coupon. For example, you could show your coupon only to shoppers in a specific location with geotargeting, or only to visitors who clicked on a specific ad. 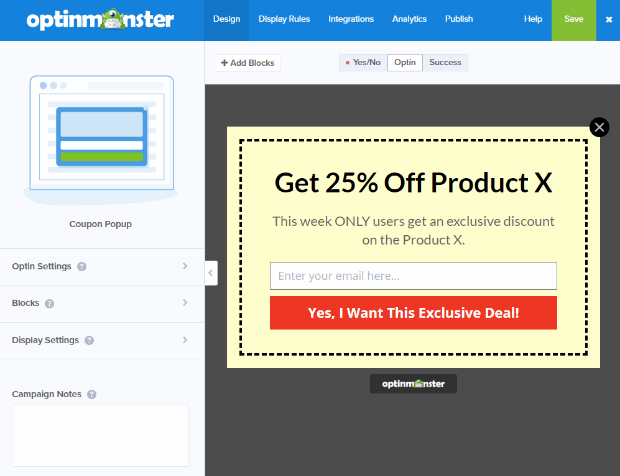 Unlike a WordPress coupon plugin, OptinMonster works on any site, no matter what content management system you’re using. That includes the industry-leading eCommerce solutions like WooCommerce, Shopify, Magento, BigCommerce, and others. And our app does more than just create coupon buttons. OptinMonster’s wide range of optin types and attractive themes give you a great starting point to create coupons customized for your business. 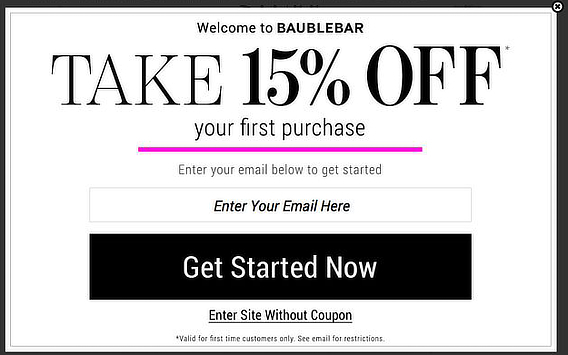 In this tutorial, we’re going to recreate a popup coupon similar to this one from BaubleBar. Use this as a starting point for creating your own – there are tons of ways to customize this coupon. 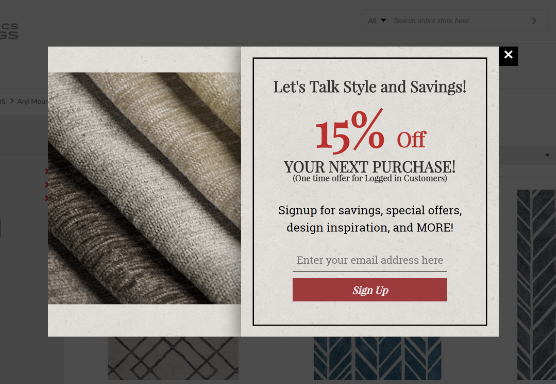 For more examples for your inspiration, check out all the coupon popups in our exit intent popup gallery. To get started, log in to your OptinMonster dashboard and click Create Campaign. Choose a campaign type. For this tutorial, we’re using the Popup. Choose a template for your popup. There are more than 30 to choose from, with different layouts and color schemes. We’re going to use the Coupon theme. Find it by scrolling through the available themes, or type “coupon” in the search box to find it fast. Give your campaign a name, choose the website you’ll use the popup on, and press the Start Building button. Whichever campaign type you’ve selected, the next step is to customize the design and the copy so it meets your needs. After you press Start Building, you’ll be taken into OptinMonster’s amazing drag and drop campaign builder. You’ll see a live preview of the default Coupon popup on the right and the editing tools on the left. Our BaubleBar example has a different headline and body text and is a different color. Here’s how you achieve that. Click on the headline to bring up the element editing tools on the left. Then, type your new text in the text box. You can format the text with the available tools. Your headline will be the one big thing you want people to know about your offer, like the “Take 15% Off” statement in the BaubleBar example. Use the same method to edit the body copy. You can add more details of the offer, and what visitors have to do to get it, such as enter their email address. We’re not going to use an image in our popup, but adding an image to your optin is really easy. Click on +Add Blocks, then drag and drop the image element to the live preview. Images usually reflect your business, the offer you’re making, or both. As you’ll see in the examples at the end, some businesses photograph their products. But there are also plenty of places to get attractive images for free. Check out our guide to 39 Places to Find Images for Better Conversions. Now we’re going to change the background color of our popup from yellow to white to brighten it up. That happens in Optin Settings » Optin View Styles. That will get you directly to the home menu where you can access the rest of the editing tools easily. Again, we want to go to Optin Settings » Optin View Styles. Once there, we’re going to change our background color to hex code #ffffff. You can do all other things too, like add an image, overlay color, or a border. Click on the submit button in the live preview to bring up the Editing Fields Element menu on the left. 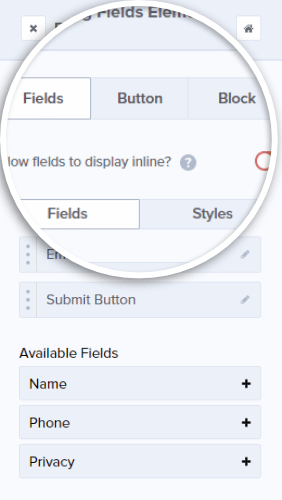 Here you can edit your optin fields and button formatting and actions. Change your button text by clicking on the Button tab and typing your text in the Button Text field (we’re using “Get Started Now”). This is the call to action, which is the one thing you want visitors to do to take the next step. Check out our guide to writing the perfect call to action for more inspiration. Once you’ve finished the basic design, it’s time to think about how your customers will get their coupon after they hit the submit button. There are several ways to do this. At OptinMonster, we recommend that you deliver it immediately via our Success view and also send it by email. You’ll need to enable your email service provider integration for this to happen automatically. Type in the coupon code on the success view as shown above. You can edit this in the same way as the other parts of your campaign. Alternatively, redirect visitors to a new page where they can redeem the coupon. The Success view is already set up as the default button action. This means that you don’t have to change a thing in your button action and your optin will show visitor’s whatever Success message you design in your Success View. If you want to change your button action to do something else, like send visitors to a different page once they opt in, you’ll need to change the button action. After you’ve edited your button text, click on the Action section. Click the dropdown under Form Success Action to see the actions available – there are quite a few of them! Select Redirect to a url and type your URL in the Redirect URL field. This is really handy for sending users back to a checkout page to use the coupon you’re giving them. You can also use a coupon link as the redirect URL, which will apply the coupon automatically when visitors arrive at the target site. Here’s how you create those via Shopify and WooCommerce coupon plugins. And be sure to check out our list of the best WooCommerce plugins and tools or best Shopify apps for more. When you’re happy with the look of your popup coupon, it’s time to choose when and where visitors will see it. To do this, go to the Display Rules tab. You have several options for displaying your popup coupon. First, you can use the default After X Seconds rule, which ensures that visitors always see your campaign after they’ve been on your site a while. The default is set to show your optin after 5 seconds. If you want to remove a condition, just click the minus button next to it. You can also show your optin based on a specific date or time rule, and set the popup coupon to be displayed on or before a certain date. If your offer is time-limited, this is a useful rule to apply, so your coupon only shows until the end date for your discount. But our highest-converting option is the popup with exit intent. This ensures that your popup coupon appears when visitors are about to leave your site. That strategy is proven to reduce abandonment, which means more revenue for you. 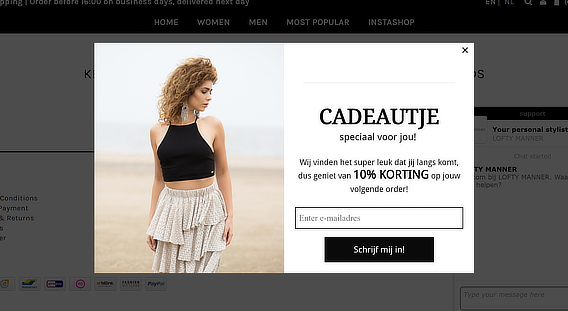 Feel free to also combine multiple display rules to target your coupon popup more precisely. The final step is to save your changes, then publish your campaign. To start the publishing process, click on the Publish tab to see publishing options, then toggle the status button to make it live. You’ll need to install our WordPress plugin to get your popup coupon on WordPress. 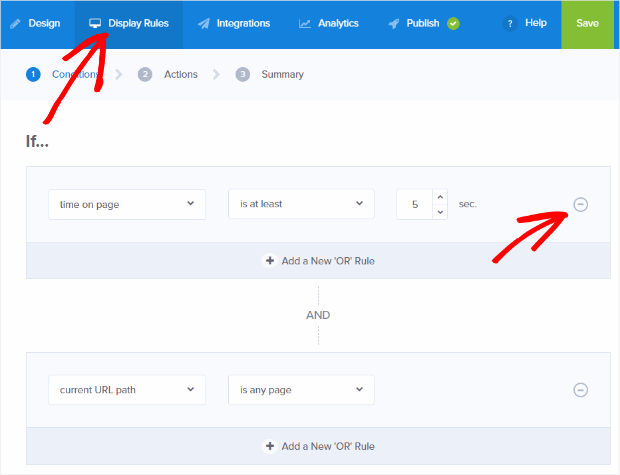 Once you’ve done that, go to the OptinMonster section of the WordPress dashboard, and click Refresh optins. You’ll see the name of your new campaign, and you’ll also be able to see if it’s live. You can also use the sitewide embed code, which you can grab by clicking on a button. Give this to your web developer to make your OptinMonster integration live, or do it yourself by following this guide. 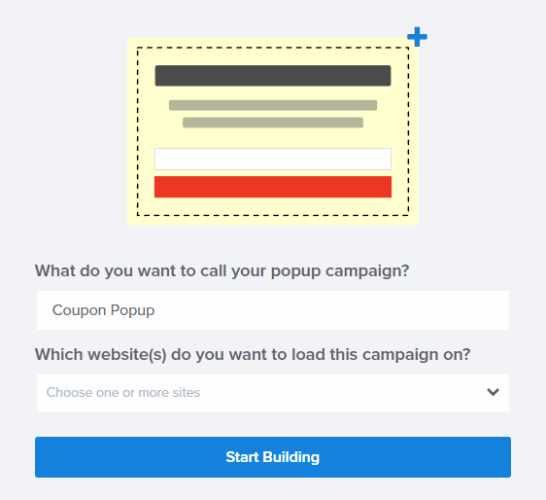 And you can use the campaign-specific embed code to embed your popup coupon only. Here are some examples of popup discount coupons. Home Fabrics makes a one-time offer for new subscribers. Since it shows up for logged in users, they’ll likely be using an integration like Mailchimp’s Coupon Carrier to deliver it. 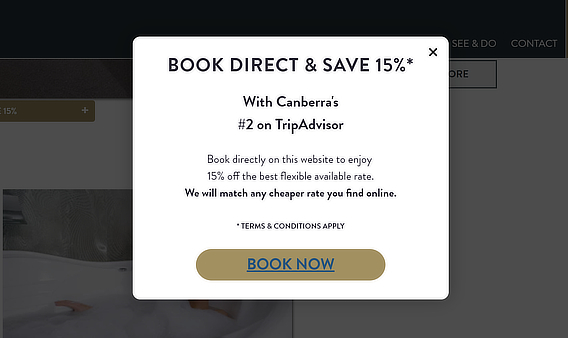 Avenue Hotel’s Book Now button takes you to a page where the coupon is applied. Now you know how to boost sales and recover lost revenue with a popup coupon. If you enjoyed this tutorial, check out our guide on how to engage with AdBlock users to unlock lost ad revenue, and see our email marketing guide for more tips on using email to connect with your customers. Not using OptinMonster yet? Get started today and start converting more visitors into subscribers and customers!